Interference is the biggest problem – by far. It is difficult to do a good centerboard, its difficult to do a good hatch, its difficult to do a good rigging, but the biggest difficulty is to make it all work together, in harmony and in an optimal way. Below is an example. I was making waterproof stowage in the saloon. Putting up the frame of edges that takes the gasket. Everything was fine. 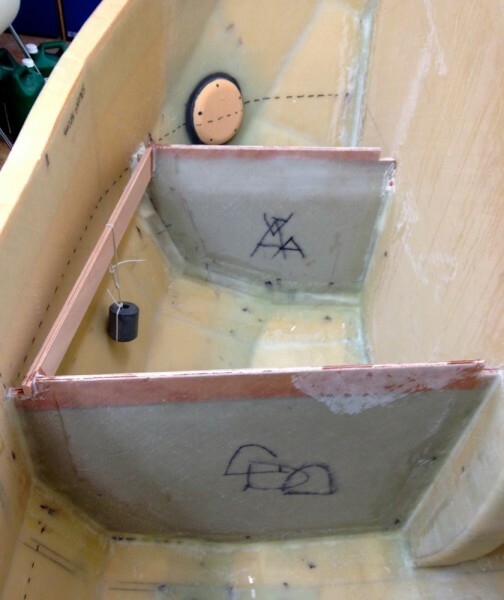 The most practical way of building a small boat is to first finish the interior, then do the deck. Suddenly I realized that when the deck is on I can only lift the lid to the stowage hatch 6 or 7 inches, because the side-decks tumblehome, not very practical. Luckily I had only done one edge before I realized what a terrible mistake I was about to make. What if I had put on the deck first. A disaster, it would have been impossible to put in the four 120 amp batteries for example. The more complex a boat is the more interference. The bigger the boat is the more complex it is. Each new component can interfere with all the previous ones. We get an factorial function. They increase extremely rapidly. 6 elements gives 720 combinations. 24 elements gives 6 to the power of 23. That is if you like to check them all you have to do 1000 checks each second for a time 1000 times longer than our universe has existed. Luckily not everything interferes with everything else. Problem is how to know. 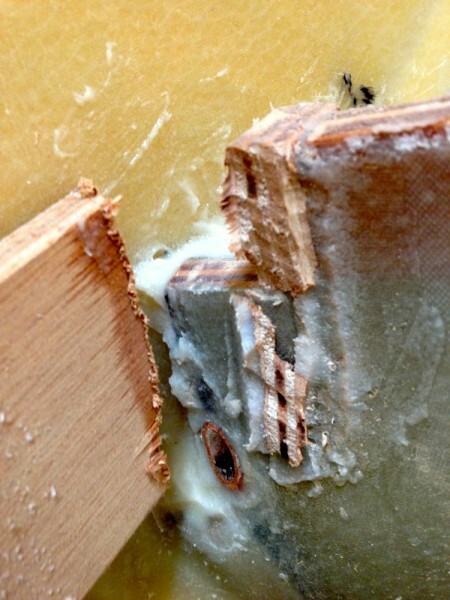 Below is the edge in place and grinded away. Below the created mess -but I fix it.